How to implement online run time server records update feature with Insert, Show, Update, Delete and select feature to send data from app to MySQL database using PHP. 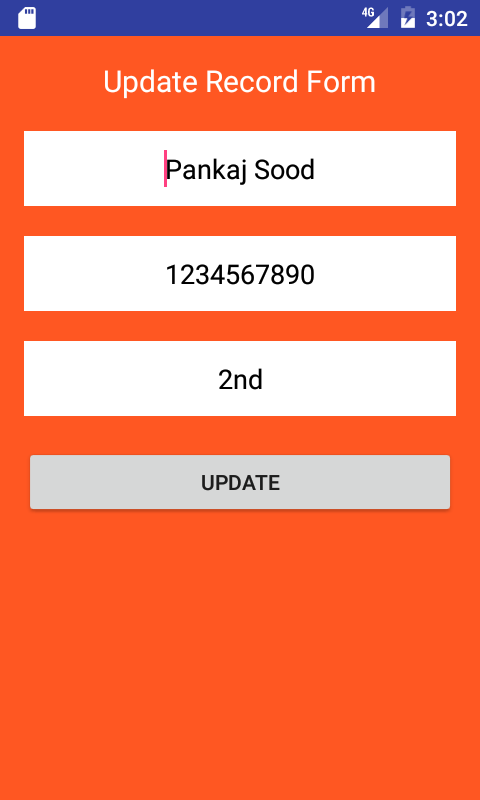 What we are doing in this project :- In this project we would going to create an android application which would consist the real time app to server record updating feature, Means all the data is send directly through app to MySQL database online server. So here is the complete step by step tutorial for Android PHP Add Edit Delete View Select Using App To MySQL Database. Send User Registration data to online MySQL database using PHP. Show all the students record on screen inside a dynamic custom ListView arrived from server. Implementing setOnItemClickListener() on ListView to get selected Item from ListView. Sending the selected item to next activity using intent. Display the selected Student record on activity directly from server. Delete the only selected already open record and also delete the record on server. Edit – Update the selected record online. Watch live demo to see how the app works. Create a database including table on your server. Create and upload PHP files to perform various operations. Star a new android application development project. 1. Watch the live demo of this application. Create a database on your server and then inside that database create a fresh table named as StudentTable . 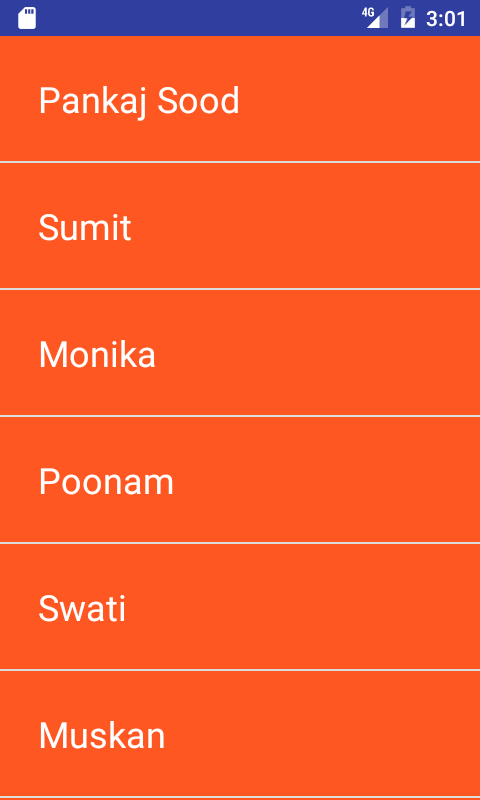 Inside that table create 4 different columns id, name, phone_number, class like i did in below screenshot . There are 6 different type of PHP files present in this project and each file has its own work to do. DatabaseConfig.php :- This files holds server configuration like server hostname, server password, server username and server database name. 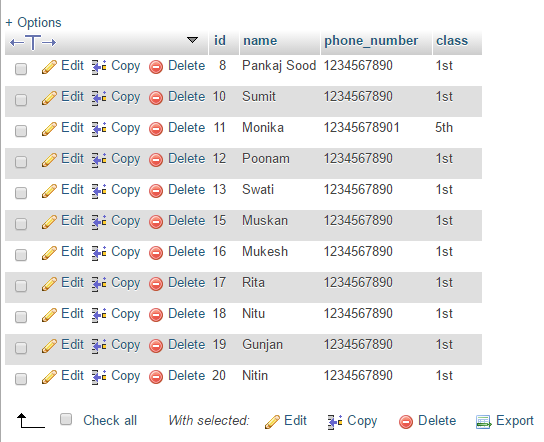 AllStudentData.php :- This files parse all the student table records into JSON. StudentRegister.php :- This file receive the student registration details coming from android application and insert into MySQL database. FilterStudentData.php :- This file would filter the student data with SQL query and return the result as JSON from. UpdateStudent.php :- This file receive the student edited record and replace them with previous records. DeleteStudent.php :- This file would delete the selected student record with student ID. 4. Star a new android application development project . 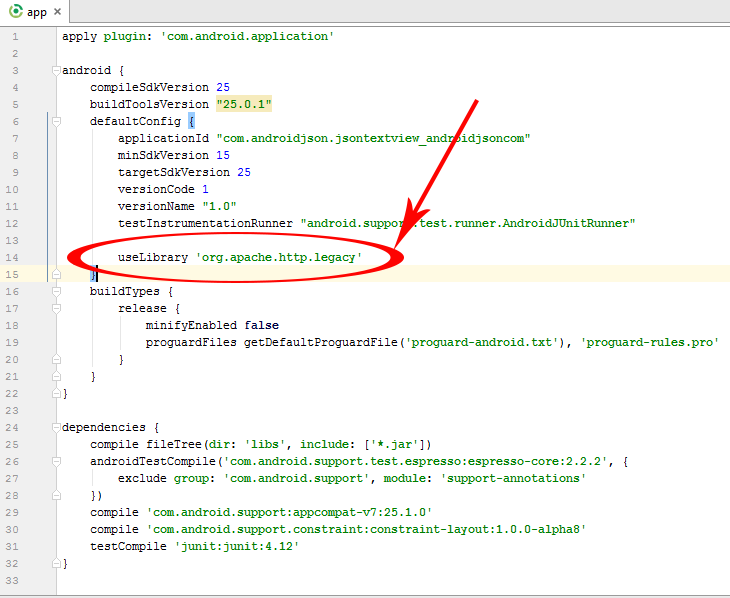 Open your project’s AndroidManifest.xml file and paste below internet permission inside it. 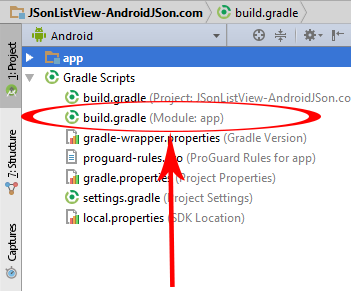 You can file AndroidManifest.xml file all source code at the bottom of this page along with all application source code. // If EditText is not empty and CheckEditText = True then this block will execute. // If EditText is empty then this block will execute . //Adding ListView Item click Listener. // Sending ListView clicked value using intent. //Finishing current activity after open next activity. // JSON parse class started from here. // Passing HTTP URL to HttpServicesClass Class. // Adding Student Id TO IdList Array. // Http Url For Filter Student Data from Id Sent from previous activity. // Http URL for delete Already Open Student Record. //Receiving the ListView Clicked item value send by previous activity. //Calling method to filter Student Record and open selected record. // Sending Student Id, Name, Number and Class to next UpdateActivity. // Finishing current activity after opening next activity. // Add Click listener on Delete button. // Calling Student delete method to delete current record using Student ID. //Storing Complete JSon Object into String Variable. //Parsing the Stored JSOn String to GetHttpResponse Method. // Parsing Complete JSON Object. // Storing Student Name, Phone Number, Class into Variables. 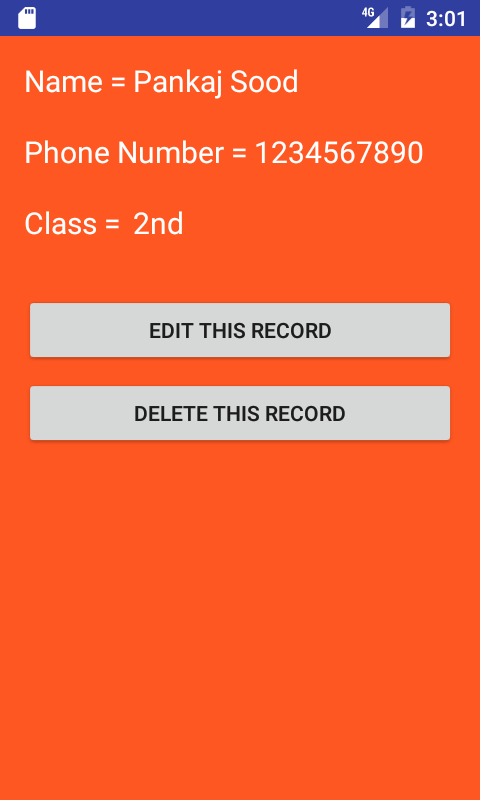 // Setting Student Name, Phone Number, Class into TextView after done all process . 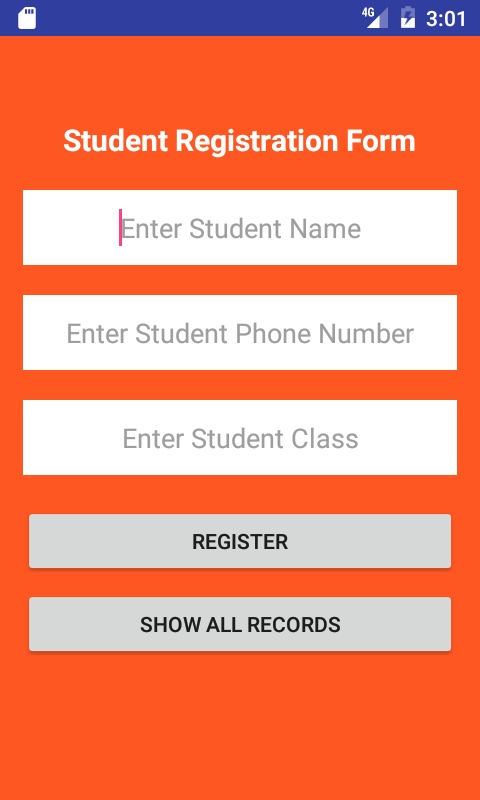 // Receive Student ID, Name , Phone Number , Class Send by previous ShowSingleRecordActivity. // Setting Received Student Name, Phone Number, Class into EditText. // Adding click listener to update button . // Getting data from EditText after button click. // Sending Student Name, Phone Number, Class to method to update on server. // Method to get existing data from EditText. // Method to Update Student Record. * Created by Juned on 3/3/2017. * Created by Juned on 3/4/2017. Code for activity_show_all_students.xml layout file. Code for activity_update.xml layout file. Code for listview_item.xml layout file.